First of all, let me say that this brewery has yet to turn out a beer that I have not liked, nay, loved. Darren Connor of Bier Brewery is master of the small batch. Along with Ben and Corbin, his two assistant brewers, he manages to take each style of beer and make it his own. With an SRM of around 6, Bier Brewery's Belgian Golden Strong Ale is a deep golden color with good clarity. The beer itself is very effervescent which is true to style. The beer has a very defined malt character as opposed to its minimal hop presence. This makes for a very sweet, very alcoholic beer. By that I do not mean that there is a heavy alcohol taste that comes through in the beer which has been the case in some belgian strong ales that I have seen, either golden or dark. Instead there are notes of light fruit like peaches and pears as well as the distinct flavor of honey. As is true with many of the beers that are on tap at Bier Brewery, this one will probably be gone by the time many of you will read this. Don't fret though. I fully expect to see this beer again. If I had to rate this beer in terms of being true to its style, I would give it a 94. Overall, and this is just rating the beer to my preference, I would give it a 82. I say that because when I picture the ideal beer, I see it as one with good balance between hop and malt, average alcohol content, and good clarity. I would highly recommend a visit to Bier Brewery. Where, as they would say, you can,"Come Taste Our Awesomeness." On a recent trip to my hometown for a wedding last weekend, I had the opportunity to try the latest seasonal from Sierra Nevada. 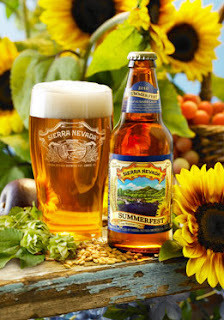 Summerfest is a European-style lager which means that according to style it should be light in both malt and hop profile. For the most part this beer accomplishes its appointed task. This beer, with an SRM of about 5 or 6, is very light in color. With its use of Czech Saaz and Perle hops, it achieves a good balanced hop profile that is very dry in character. Honestly, this beer's name sums it up perfectly. By the way, I realize this is not an Indiana beer, but I felt like I should branch out a little bit to some of my favorite beers. I would probably give this beer about a 95 in being true to style. As for the overall score of this beer, I would probably have to give it an 88 just because even though it does remain true to style and the beer itself is very balanced. I felt as if it could have used a little heftier mouthfeel. This is a beer that I would definitely pick up in the liquor store and would be worth the money. Be sure to check out other beers from this Chico, CA brewery's lineup as it has always been a strong and innovative one. A couple weeks ago, I was able to have drinks at the Tomlinson Taproom located at City Market in downtown Indy. I have to say, the experience was great. The taproom offers a selection of 16 taps filled with craft beers from breweries located ONLY within the state of Indiana. In fact, some of the beers on tap were ones that you could only get at the breweries themselves. This was a real treat considering I love Indiana craft beer, but I don't have the time, energy or money to drive to places like New Albany, Bloomington, or Munster. I was able to get a pint of beer from a small nanobrewery located right here in Indy that does not distribute called Bier Brewery. It is my understanding, also, that this brewery will be featured on a regular basis exclusively at the Tomlinson Taproom. I was able to sample their pale ale called PDG Pale as their Belgian Dubbel. As was the case in previous experiences, I was impressed. Unfortunately, the Taproom is the only part of the City Market that is open at many times of the day, including evenings. Upon arriving to the location one may feel as if they were walking into a ghost town. Other than lunch hours, much of the market is closed. I wouldn't have known where to go if it wasn't for the sound of conversation coming from the second floor. In my opinion, the market is under utilized. After talking with one of the managers of the market I discovered that they are going to start requiring restaurants located within the market to stay open longer to align with the hours of the taproom. I have a feeling that once this happens, the Tomlinson Taproom and City market will become a downtown landmark that will attract residents, convention-goers, and business people alike.